With a little luck and a dominant offensive performance 5th-ranked Russia cruised by 24th-ranked Azerbaijan in straight sets inside Kobe Green Arena Tuesday night. The Russians were strong on the block, outdoing Azerbaijan 11 to 9, and took advantage of a sloppy 21 errors by their opponent to earn the victory and move to 3-0 in Pool C standings. Nataliya Goncharova led Russia with a 17-point effort, followed by Kseniia Parubets, who contributed 13 points. Azerbaijan was paced by Polina Rahimova, who posted 19 points in the match. Odina Aliyeva added 8. Though 34th-ranked Trinadad and Tobego registered its first set win in FIVB World Championship history, 16th-ranked Thailand downed its opponent in 4 sets in 2018 FIVB World Championship action Tuesday. To earn the win, Thailand out performed its opponent in blocks (12 to 7) and service aces (11 to 5). A total of 26 errors stalled Trinadad and Tobago’s upset bid. Just before Trinadad and Tobego earned the win in the third set, Thailand opposite hitter Pimpichaya Kokram exited the match with an injury to her right knee. She was taken to the hospital for evaluation in a wheelchair, but Thailand head coach Danai Sriwachamaytakul was optimistic after the match. Thatdao Nuekjang and Ajcharaporn Kongyot led Thailand to victory with 17 points apiece, followed by Pleumjit, who added 15 points. Krystle Esdelle and Channon Thompson registered 15 and 14 points, respectively, for Trinadad and Tobego, which is making its first-ever appearance at the FIVB World Championship this year. 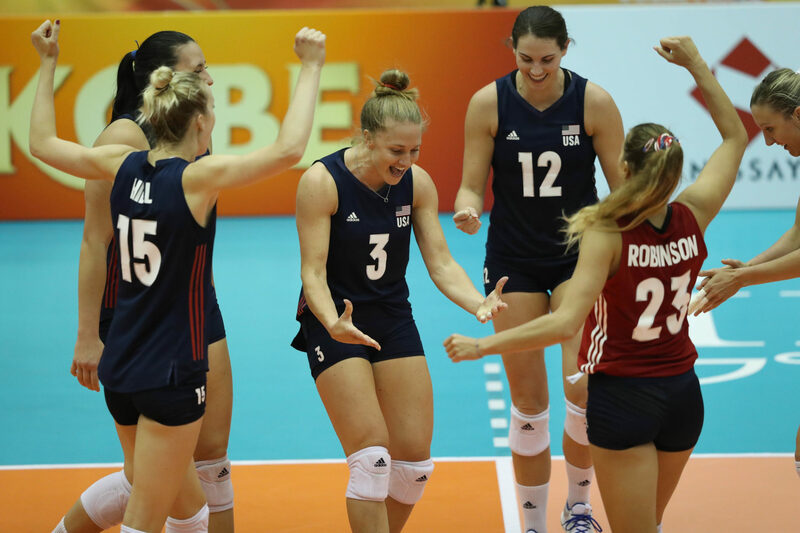 2nd-ranked United States recovered from a slow start to earn a 4-set victory against 10th-ranked South Korea to move to 3-0 in Pool C competition at the 2018 FIVB World Championship Tuesday. With 2 matches remaining, the Americans have already clinched a spot in the 2nd round. Though South Korea held the edge in blocks (10 to 8) and service aces (8 to 7), it was not enough to dethrone the USA, who were led to victory by Kelly Murphy’s 18-point performance. Rachael Adams also contributed 14 points. For South Korea, Jeongah Park registered 26 points, while Yeon Koung Kim contributed 17 points.